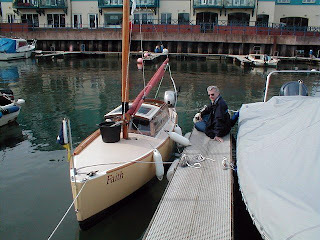 ‘Faith’ was a boat like no other I have owned. I built her over two years, taking 18 months to complete. Apart from minor modifications to her internal floor, she was built exactly to Matt Layden’s excellent plans. In fact, the materials used were the very best I could obtain: marine ply - whereas I could have used exterior ply; teak off-cuts for the cabin top runners, and a 10 year leaching epoxy antifouling was applied to her bottom. Her second-hand trailer was almost new. 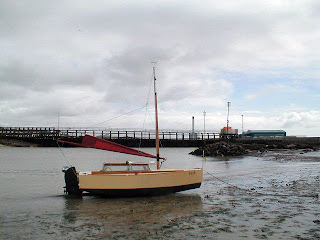 ‘Faith’ was different, because instead of having a keel or centreboard, she had chine runners. These were wedged-shaped protrusions running two-thirds of the boat’s length along her chines. She was also different because of her very large kick-up rudder which helped provide lateral resistance. Smaller than some dinghies, she could be managed from within a cosy, secure cabin which protected her solo crew from the elements. Ballast was a combination of water contained in two tanks, and pigs of lead bolted to her floors. She was rigged with a single, boom-furling lugsail, arranged in such a way that the halyard, furling line, and topping lift were led into the cabin via a watertight ventilation box in which the mast was shipped. There was a drain at the bottom of the box to allow any water entering it to escape. The mainsheet passed through a hole in the transom, as did the tiller above a draining baffle. ‘Faith’ was a comfortable and easy boat to manage. In fine weather her helmsman sat facing forward on a raised transverse seat at the aft end of her cabin. When seated thus, he had a good view over the top of her cabin, and when the hatch was slid forward he could stand and move around. Steering was done by holding a continuous line that ran through blocks and was attached to the tiller. If the weather was bad, or the sea was rough, or if it was raining, her crew could stow the seat and sit on a cushion on the floor from where he could close the hatch. In that position the steersman had an all-round view through the large Lexan windows, at the same time being warm and dry inside the cabin. Being ‘encapsulated’ was not at all a claustrophobic experience. There was always plenty of light coming through the hatch window, which also allowed the helmsman to see the burgee and the peak of the sail. I equipped ‘Faith’ with a Honda 2.3 petrol outboard in addition to her yuloh. I do not regret missing two sailing seasons while ‘Faith’ was being built. On the contrary, building her was half the fun and sailing her was the other half. Besides day-sailing and cruising her locally, I towed her overland to various locations, including a DCA meeting at Chichester Harbour. Twice I took her to the West Country: first for a cruise to the Scilly Isles from Falmouth with my friend Al Law in his Paradox. We did not reach the Islands because of persistent headwinds, but we enjoyed a fine cruise to Exmouth. The following year, after sailing from Burnham-on-Crouch, I met Al at Plymouth for our second attempt at reaching the Scillies. This was highly successful. We had a great adventure. On our return to Plymouth I travelled home to Essex by train to retrieve ‘Faith’s’ trailer. All in all, we had a most satisfying cruise. 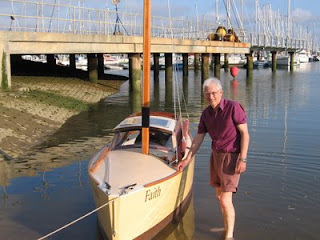 Yesterday’s Blog contains links to YouTube videos of ‘Faith’ sailing. Minnow is looking GREAT Bill!!!! Go Go Go!!!! Summer is coming!!!! I am the current owner of your lovely sailing canoe you built, Caleb! I also remember many years ago seeing two Matt Leyden paradoxes anchored up in the Duck Pond, Exmouth....I now realise one of these must have been Faith. I was hoping to contact you but wasn't sure of the best way. Perhaps you could email me if you wouldn't mind me getting in contact? My email is: "andy at rxmarine.co.uk"